Most of us have probably played around with our signatures and eSignatures and have even taken fun personality tests that show who we are based on the style we show when signing our name. It may seem a bit far-fetched, but there is a science dedicated to analyzing and understanding handwriting styles. And while it’s fun to try to understand how and why we sign the way we do, there’s definitely a serious side to creating and projecting a personal signature. Some of the more obvious signature cues include angle, size, legibility, completion, and embellishments. Let’s learn more about what your signature says about you and does it really matter in today’s digital and hyper-speed mobile world? You’ve probably seen more than one signature with a definite upward or downward slope. These styles tend to indicate either high or low confidence and it’s easy to see how they’re defined. Which one of the signatures below would you characterize as being more optimistic and high energy based on the slant of the signature? Another factor is the size of a signature. Typically, the larger and bolder the signature, the more confident the individual. It doesn’t take much to think that this person has the confidence to spare. Legibility matters a great deal to some people and others don’t even attempt to rein in their wild signatures. This is also a sign of how people feel inside and how their personality exhibits in their signature. If a signature is simply illegible, it’s probably fine with the owner who prides himself on being a rebel and someone who enjoys mystery and intrigue. If a signature is incomplete or just a nickname, it suggests that the owner has high self-esteem and is preoccupied with efficiency. It simply takes too long for some people to sign their name when they feel there are more pressing matters for them to attend to. Some people add embellishments to their signatures to add additional flair which they feel conveys their personality. Curlicues, dots, and dashes all convey personality flourishes exhibiting determination, drive, and persistence. However, with the growth of eSignatures, and the difficulty of capturing exact handwriting, what we can glean about the signer’s personalities will matter less. The science of signatures can be fun to analyze but creating and using eSignatures can dramatically impact the nature of conducting business. It used to be that contracts could wallow in someone’s to-do pile for lack of getting them signed and returned in a timely manner. Business agreements may have been verbalized but nothing was official until the pen met the paper and sealed the deal. Fortunately, companies no longer have to wait unnecessarily for signed agreements due to electronic signatures. eSignatures have been accepted legally since the passage of the Electronic Signatures in Global and National Commerce Act in 2000. The term `electronic signature’ or eSignature as it is commonly referred to, means an electronic sound, symbol or process, attached to, or clearly connected to, a contract or form and executed by a person with the intent to sign the record or form. eSignatures are legally binding for nearly every business or personal transaction. 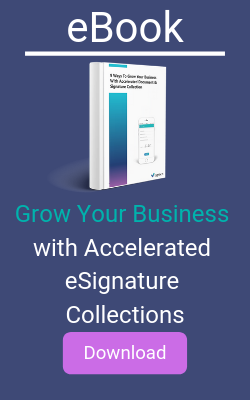 Businesses can obtain eSignatures legally that are binding from their customers, even while the customer is out of the office and on a mobile device. Businesses trust electronic records and legally-binding electronic signatures thanks to its simple user interface and its security procedures. Most of the electronic signature choices already in use operate with secure digital technology. And chances are that they are ESIGN and UETA compliant as well. But these are rather basic criteria to meet. To enhance the customer experience and drive business value, you’ll need to use an eSignature that’s more in line with the behavior of today’s consumers. ● Is it easy to use? ● Is it in real time? In short, next-generation mobile ready eSignatures unlock enormous value from their customer interactions, removing friction that frustrates the customer expereince, hurts business and weakens brand loyalty. eSignatures may not have the entertainment appeal of analyzing personalized handwriting samples but they’re good for the most important thing of all: securing business agreements when customers are ready to sign in order to process sales in a timely manner. Myprint247 created a great infographic of signatures from famous tech leaders and possible revelations about their personality. Which one is your favorite?